As a rule of thumb, most knife nerds steer clear of blades with assisted openers. They’re regarded as obnoxious, tough to maintain, and not as prestigious as something with a truly dialed in detent. But can you guess which type of folks tend to prefer assisted openers? In my experience, the answer is simple – Those who actually use their knife as an everyday tool. This brings me to the Benchmade Mini Boost. I know about AXIS Locks, but I’d never handled an assisted one. So, when the company offered to send one over for review, I leapt at the opportunity. Here’s my review of the Mini Boost, a blade which just might change the way you think about spring-fired knives. As its name would indicate, this is the compact version of Benchmade’s USA-made Boost design. It sheds nearly an inch and a half of its predecessor’s length, now reaching a modest 7.18-inches open. Blade span has been reduced from 3.7-inches to 3.11, while slimming the stock from 0.12-inches to a demure 0.10. The CMP-S30V steel remains the same, as does its drop point, flat ground nature. Last is the weight, plunging from 4.59-ounces to 3.31. Enough numbers. Let’s flick the thumb stud, fire the AXIS Assist, and get to business. As you can see from the cutting board photos, the Boost’s thin blade is an excellent slicer. Despite its American roots, the knife proved invaluable in the preparation of homemade General Tso’s Chicken. I had no trouble producing finely chopped pieces of ginger, garlic, and green onion. It proved equally capable in other daily chores, breezing through bags of dogfood and those annoying boxes for the toner cartridges at work. This does bring up something of a sore spot. When you use things, they tend to get dirty. I like to maintain my tools, which usually involves some form of disassembly and cleaning. The Mini Boost, however, will get no such treatment from me. AXIS locks are fiddly to take down in the first place, but add in what I assume is some form of torsion bar or coil setup and, man, I don’t need that kind of frustration in my life. The bronze washers are easily accessible, and a periodic application of oil may be all you need to keep it firing reliably. Speaking of reliability, I must have picked a good time to start reviewing Benchmades. While I’ve heard and read many complaints about their production and quality control, each of the three blades I’ve handled had zero problems. Maybe they’re closely monitoring the reviews samples, but I have nothing negative to report. First impressions count for a lot, but they can also be deceiving. Take the Mini Boost’s width, for instance. My immediate in-hand reaction was, “Wow, this thing is thick.” And it is: 0.63-inches from a statistical standpoint. But take a look at this side-by-side comparison with the Spyderco Native 5. See that? The spines are pretty much identical, though the Boost’s sides swell out a bit further. In the pocket, this width is surprisingly comfortable. Part of this is due to its excellent deep-carry clip. The knife rides low in the back of my pocket, where its girth actually puffs out the seam and makes the rest of my tools more accessible. I prefer thinner knives, sure, but this slightly wide feel also helps with grip. The polymer scales are a perfect pairing, though they can accumulate a bit of pocket grit. Still, I consider this to be an acceptable hazard for a work-first blade. Let’s revisit the assist. Because of its sensitive thumb-stud deployment, Benchmade has included a safety switch above the AXIS Lock. This sends a piece of metal sliding into the mechanism, preventing the knife from accidentally deploying in your pocket. While I applaud their prudence in including this safety measure, it does cut down on some of the quick-fire appeal of an assisted blade. It leaves me wondering if assists and AXIS Locks are really meant to go together. It works, but the process definitely takes some getting used to. And while you certainly can carry it with the safety retracted, I was never quite comfortable with the idea of a loaded blade in my pocket. That being said, management of the AXIS Assist quickly becomes second nature. I carried this blade for nearly a month before completing the review, during which time I grew to appreciate both its deployment quirks and slicing prowess. One-handed closing is tricky, sure. But I kept fidgeting with it, over and over, just for the satisfying SNAKT noise of the blade leaping into place. For all its added complication over something like the Kershaw SpeedSafe, this assist is much more fun. Let’s close with a thought experiment. Imagine you’re working a manual labor job in a dusty, grimy environment. Would you prefer a slick-firing folder running on ball bearings or an easy-opening blade sandwiched between phosphor bronze washers? For me, the answer is simple – Assist all the way. Because, sweet as that bearing action may be, it’s only a matter of time before job site gunk finds its way into the action. The solid washers and spring will run faster, longer, and more reliably in most hard-use situations. As such, I consider the Mini Boost to be a solid argument for the existence of assisted knives. This, along with the Zero Tolerance 0566, is a solid example of spring-fired excellence. Yes, it’s trickier to maintain. But when it comes to down and dirty work, most of the calloused-handed folks I know prefer a blade with fast-deploy capability. I can’t tell you how many Kershaw Leeks and Ozark Trail folders I’ve seen peaking above the pockets of coveralls and dusty jeans. In the end, the Boost proved to be a perfectly acceptable single-solution knife. It carries easily, cuts like crazy, and holds a decent edge. I’m still perplexed by the sudden resurgence of S30V, and I’d certainly prefer a better steel at this price point. But aside from the S30 and its pudgy width, there’s not a lot to dislike here. While I still prefer the mechanical precision of a dialed in detent, I’m also not the sort of hard user who cuts through boxes and bags all day. If that’s you, then consider checking out the Benchmade Mini Boost. 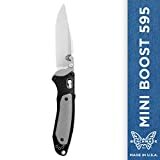 I recommend purchasing the Benchmade Mini Bost at Amazon or BladeHQ. Please consider that buying anything through any of the links on this website helps support BladeReviews.com, and keeps the site going. As always, any and all support is greatly appreciated. Thank you very much. As much as I enjoy picking up the latest “gee whiz” must have knife of the moment, I get the most satisfaction in sharing a great knife that may have flown under the radar. This particular knife has flown so far under the radar, I would not have even heard about it if reader Darren hadn’t gone out of his way to send me a couple emails about the knife and how much he enjoyed it. Thank you, Darren. Enter the Benchmade 560 Freek. Like our friend the Bruised Forehead, the Freek didn’t win the knife name lottery. It also doesn’t benefit from being designed by a high profile knifemaker. And I don’t recall much in the way of fanfare from Benchmade or the knife collector community when the Freek arrived on the scene. It was quietly released. Rather than being a subject of media attention, the Freek has slowly earned a reputation for being a practical tool from those who have given this unassuming knife a chance. I liken the Freek to the Benchmade Volli, another no-frills knife that didn’t get much attention, but may be be one of the best all-round EDC knives that Benchmade has released in the past 5 years. The Freek is cut from the same cloth. It’s another function over form design that is worth consideration if you are in the marketing for a largish EDC knife. The Freek has an overall length of 8.46″, a 3.6″ blade, and it weighs 3.72 ounces. This knife is made in America. As I mentioned earlier, I’d classify the 560 Freek as a large EDC knife. It could possibly be used as a hunting knife, as it has a good belly and shares the blade profile of their Saddle Mountain Skinner. Of course a knife of this size could also be used as a duty knife for a police officer, or perhaps pressed in to other self defense type applications. This is a versatile knife. The drop point blade is distinguished by a curving thumb ramp and high flat grind. The blade is 2.9mm thick, and gets thin behind the edge thanks in part to that high flat grind. The edge has been neatly applied, and like on pretty much all the Benchmades I’ve owned over the years there, is a sharpening choil allowing you to sharpen the edge all the way down to the heel. The tip is fine, but the the deep belly keeps it out of the way. Again, this lends me to believe this could be a decent hunting knife, although frankly I’ve never been on a hunt in my life. Benchmade has gone with tried and true S30V steel for the Freek. Although S30V has fallen slightly out of favor thanks to the widespread adoption of it’s more exotic cousin S35VN, I find that Benchmade does a particularly good job with their S30V. Case in point my Volli with its 2.5mm thick blade cuts like almost nothing else I own. That thing is a laser. The Freek is right up there. This knife is a phenomenal slicer, the S30V blade holds an excellent edge, and I found it to be an easy edge to maintain with strops and the ceramic rods from my Spyderco Sharpmaker. This knife makes quick work of cardboard, laughs in the face of of your lunchtime apple, and will capably assist you with all those odd cutting tasks that crop up in our daily lives. Much like the Volli, the Freek is a knife that I looked forward to busting out when it came time to break down a box or open a package. It’s a performer and the S30V blade steel punches above its weight thanks to the heat treat and grind. The handle is where things get interesting, and also where the knife is bound to alienate a significant section of the audience. Like the Griptilian, this is a plastic handled knife with partial stainless steel liners. Unlike the Griptilian, the Freek has a unique high density rubber (“Versaflex”) overmold that is bonded to the plastic. The end result is a lightweight grippy design that is unlike anything else in my collection. Some will love the lightweight nature of the design and the non-slip feel to the handle. Others will dismiss it as being cheap and plasticy. If you couldn’t stand the feel of the handles of the original Griptilian, then my guess is you will want to skip the Freek. But if you don’t mind trading G10 for a large ultra light knife, then the Freek could be a winner for you. The ergonomics of the Freek benefit from a streamlined handle design. There are few curves, and little reliance on jimping except for the thumb ramp. Although the handle is textured, it’s not an abrasive knife in the hand. The end result is a no-frills handle that is comfortable and secure in all kinds of conditions. The Freek easily accommodates my larger hand, and the handle is well suited for extended use and hard tasks. This knife comes from the factory with Benchmade’s split arrow clip. I’ve long been a fan of this clip, and here it is situated for ambidextrous tip-up only carry. This is a discrete knife that and buries deeply in the pocket. Benchmade left part of the FRN endoskeleton exposed where the pocket clip meets the handle, and that makes for easy insertion and extraction of the knife from your pocket. At well under 4 ounces I found the Freek to be an easy knife to tote around. It’s about as thick as the Griptilian and carries comparably. On that note, it’s worth stating that the Freek is actually almost half an inch longer than the Griptilian but weighs .16 ounces less. There isn’t a whole heck of a lot new here to say in this section. This is a thumb stud axis lock knife. A tried and true design. Here the thumb studs and phosphor bronze washers work just as great as they did on my original Griptilian. While bearings are all the rage, I think something needs to be said for bronze washers. Especially for a thumb stud equipped user knife like the Freek. Bronze washers are still exceptionally smooth and are ideal for working knives like this. I continue to appreciate the axis lock for it’s simple and intuitive design. Plus I always appreciate that this is a fully ambidextrous knife. Lockup is secure, but as you would expect from a plastic handled partial liner axis lock knife, there is a little side to side blade play. Nothing to get upset about, just a trade off in the design. Personally, I’m happy to exchange a modicum of side to side blade play for all the practicality and utility that this design offers. Your mileage may vary. Blade centering is pretty good. It slightly favors the pocket clip side of my knife, and is far from rubbing. For those wanting a premium lightweight work knife with an over 3.5″ blade, I think the Freek is a no-brainer. Benchmade has been refining this type of knife for years. It’s like a Griptilian but it is leaner and meaner, yet also slightly larger. Perhaps it’s oriented slightly more towards the lightweight camping and hunting ground. Benchmade doesn’t offer much insight in their product descriptions, but for some reason I keep going back to hunting when I consider the Freek. Those that can’t stand the plastic scales on the original Griptilian would be well served to steer clear of the Freek. Instead check out the Volli or the G-10 Griptilian. Those models will also provide you with great cutting performance and ergonomics, but will also be a little stouter than the Freek. I am glad Darren called this model to my attention. 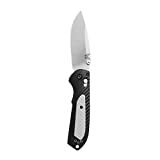 I hope in writing this review I have turned at least a couple people on to an excellent “sleeper” knife from Benchmade. 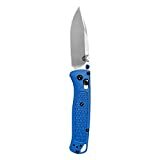 I recommend purchasing the Benchmade 560 Freek at Amazon or BladeHQ. Please consider that purchasing anything through any of the links on this website helps support BladeReviews.com, and keeps the site going. As always, any and all support is greatly appreciated. Thank you very much. It’s no secret that I think the creative team at Benchmade has been adrift for the past few years. This is perhaps best evidenced by the fact that the company’s most exciting new offerings are actually re-issues of old models: the 940-1 and 551-1. These rockstar designs are interspersed among more puzzling offerings like the 808 Loco and 300 Axis Flipper. But Benchmade does seem to be cobbling together a theme. They seem to be taking this “old school, meet new school” approach not only to their classic designs, but also by melding traditional designs with modern manufacturing in their “Hunt” lineup. I thought the Small Summit Lake was a successful mashup of traditional lockback folder with modern materials, beefy construction, and precision manufacturing. The 15080 Crooked River is a knife cut from that same cloth. In fact, the Crooked River takes the juxtoposition even further. This is an even greater departure from tradition to the point where we almost have a caricature of the classic bowie. Yet there is still a timeless quality to the knife. The low slung blade and bolstered handles tug at the heartstrings of traditional knife design, while the finishes and flourishes appeal to this fan of modern folding knives. The Crooked River has an overall length of 9.3″, a 4″ blade, weighs 5.41 ounces, and is made in the USA. This is a big knife, and is far outside the confines of what I would consider to be an every day carry (EDC) piece. If you were to whip this out in public to trim packing tape or open an envelope, most people would hide under their desk. And if a friend offered up a Swiss Army Knife at a campsite, you could go full Crocodile Dundee on the guy with this Crooked River. This is a “knoife”. I wouldn’t mind a smaller, more manageable version for daily carry. The Crooked River features a long and lean clip point blade. I have always enjoyed a good clip point for it’s practicality, and the Crooked River is no exception. The high flat grind has been nicely executed complete with Benchmade’s 2-tone stonewashed satin finish. The blade is cut from an impressive 3.15mm thick piece of S30V stainless steel, and it carries a significant amount of steel out all the way to the tip. The end result is a blade that has a good tip for piercing, plenty of edge for cutting, and a nice belly for food prep and possibly even skinning. The choice of S30V stainless steel for the blade is less exciting now then it may have been 5 years ago. These days I prefer S35VN for it’s improved toughness and ease of sharpening over S30V, but in my opinion Benchmade has always done a great job with their S30V. For example, the S30V on the Volli continues to impress me with it’s sharpness, edge holding, and ease of maintenance. I think Benchmade knows how to make the most of this steel. The blade geometry of the Crooked River is stouter than the Volli, but this is still a functional blade and the S30V performs nicely on this knife. Capable of taking a keen edge, and holding it for an acceptable period of time, the S30V on the Crooked River is still functional despite there being sexier steels on the market. No issues with corrosion either. The Crooked River has a long curving handle that compliments its long curving blade. The combination of diamond wood, aluminum bolsters, and orange pivot collar is striking, and I am sure that decision alone has sold many 15080-2’s for Benchmade. If resin-injected wood isn’t your thing, then Benchmade also offers the Crooked River with smooth gray G10 handle scales. Underneath the scales are full stainless steel liners (skeletonized) and a bright orange G-10 backspacer. Holding things together is a large black pivot and blackened steel hardware. Everything is precision fit, and there are a number of nice details to enjoy, like the arced face between handle scale and bolster, the geared backspacer, and of course the snazzy orange pivot collar. Even the lanyard hole is oval and chamfered, adding style to an otherwise mundane feature of a knife. Despite there being a good deal of weight around the pivot, the balance point on the Crooked River is behind the axis lock, and is close to the “hump” of the finger choil. The hand feels most at home here; set back further on the knife. While this isn’t billed as a tactical folder, I would be curious to get someone like Chad’s take on the Crooked River. I have no doubt that a knife like this could be pressed beyond pure utilitarian purposes if the need arose. Beyond my comments on the balance of the knife, the Crooked River benefits from a subdued approach to ergonomics and traction. The long handle provides plenty of room, even for extra large hands. The diamond wood scales offers some texture (not much), while a mild run of jimping on the back of the handle indexes the thumb while still allowing the user to cut with the knife for extended periods without significant thumb fatigue. All said, the ergonomics have proven to be adequate for my purposes. The Crooked River is a big knife. While I don’t think 5.41 ounces is overweight given the build quality and footprint, it’s still substantial, and when closed the knife is pivot heavy. This creates something of a pendulum effect in your pocket. Benchmade has tried to counter this with a stiff pocket clip. This is a good idea, and my Crooked River holds firmly in place. On the subject of pocket clips, Benchmade went with a black parkerized version of their split arrow clip. I have always liked the split arrow clip, and here it is situated high on the handle for a relatively deep and discrete carry. The handle is also drilled and tapped for ambidextrous tip up use. That said, Benchmade’s deep carry clip will fit on this knife, and if you prefer a more discrete deep carry option Benchmade typically will send you a deep carry clip free of charge if you ask them nicely. While some may grow bored with the axis lock, it remains one of my favorite locking mechanisms. I like the easy one handed opening and closing. Plus it’s fully ambidextrous. And I don’t know if I am simply bullshitting myself, but to me it looks like the phosphor bronze washers on these Benchmades have gotten thicker over the years. Much like my new 551-1, this Crooked River is smooth and easy to open. The blade pops into place with a satisfying “snick”, and the ambidextrous thumb studs are easy to get at with either hand. Unlike some of the axis lock knives that have crossed my path, my Crooked River locks up tightly and without any play. Blade play is a common complaint on axis lock knives, but I have found that most knives can be fixed with a targeted application of Loctite. Here, blade play was a non-issue, and the axis lock remains as practical and easy to use as ever. Not to get all jingoistic on everyone, but the Crooked River appeals to the red blooded American in me. This knife takes me back to my childhood, handling my dad’s old Buck fixed blade tucked away his closet next to the well worn Swiss army knives, and old harmonicas. There is an undeniable charm to the Crooked River that strikes at that primal note that has drawn many people to knife collecting in the first place. While not the most practical offering for an erudite urban EDC, the Crooked River is unapologetically bold and beautiful, and I think it is one of the nicer new designs from BM. The Crooked River is a knife that I would like a smaller version of. As it stands I don’t see it getting a ton of use personally, but perhaps it has a place in your collection. If the Crooked River piques your interest in the same way that it piqued mine, then I am pleased to report that it is a well made and satisfying folder. 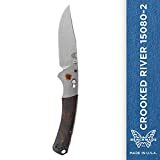 I recommend purchasing the Benchmade Crooked River at Amazon or BladeHQ. Please consider that purchasing anything through any of the links on this website helps support BladeReviews.com, and keeps the site going. As always, any and all support is greatly appreciated. Thank you very much.